We leave to the discretion of the established colonies and village the internal constitution and jurisdiction, in such a way that the persons placed in authority by Us will not interfere with the internal affairs and institutions. In other respects the colonists will be liable to Our civil laws. However, in the event that the people would wish to have a special guardian or even an officer with a detachment of disciplined soldiers for the sake of security and defense, this wish would also be granted. From the beginning of the Volga settlements in 1764, the Russian government took a paternalistic view towards the settlers who were endowed with certain privileges to entice them to Russia. In the early decades of settlement, the colonists enjoyed extensive authority to address local needs through communal institutions of self-government. For the first 100 years, they remained under a special administrative system that reported directly to the Ministry of the Interior in St. Petersburg. 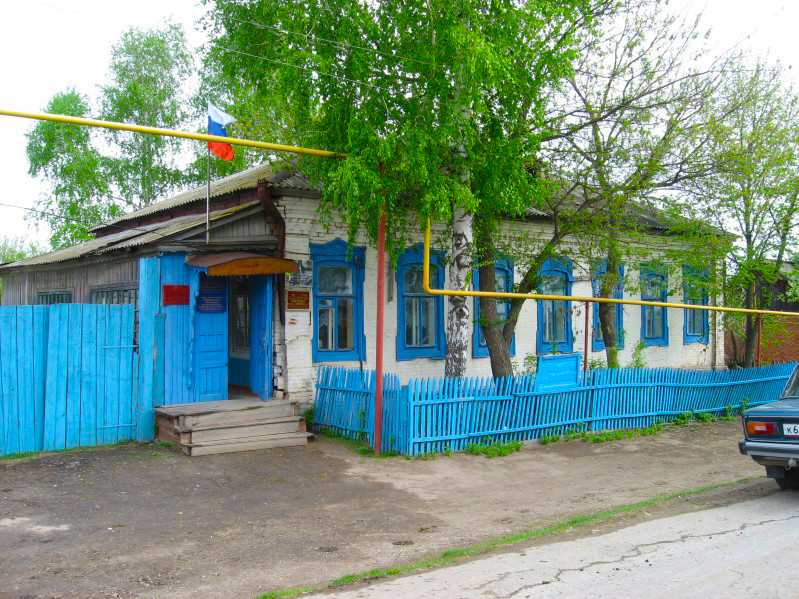 The colonists referred to this administrative system as the Kontora, which was officially known as the Saratov Office for the Guardianship of Foreign Settlers. The Kontora was established in 1766 and its sole responsibility was to assist in the improvement of the well-being of the colonists, to maintain order in the colonies and to ensure that the colonists adhered to government directives. Without its permission a colonist could not move to another colony, go off in search of a living, or marry. The Kontora provided colonists with land and property, gave permission for building houses, schools, mills, bridges and other constructions. It controlled the colonists’ behavior, settled conflicts among themselves and among colonists and the local Russian population. It struggled against epidemics, provided colonies with food when needed, and promoted the development of agriculture, cattle-breeding, and gardening. By the 1860's, the Kontora had a staff of 24 people, including 4 highly paid inspectors who frequently visited the colonies. The Kontora kept a watchful eye on the colonies, who received much more scrutiny from the government than the Russian peasants. 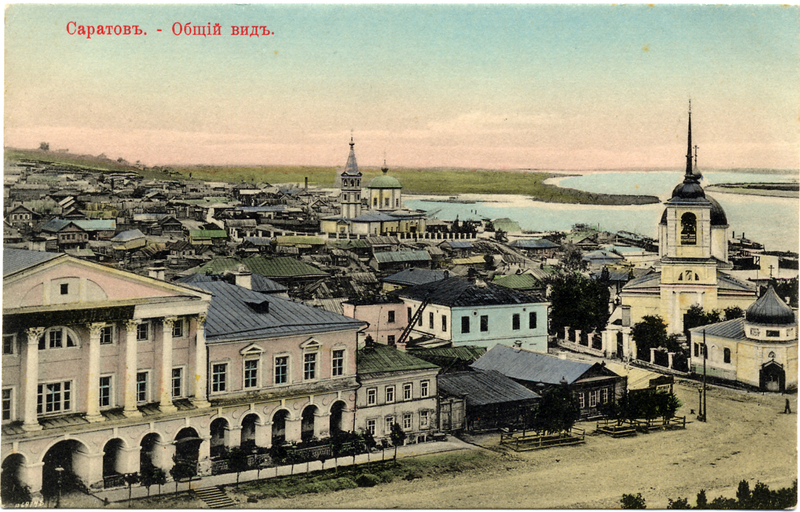 Postcard showing a view of Saratov and the Volga River. Courtesy of Steven Schreiber. Despite its sometimes bureaucratic shortcomings, the Kontora was generally an honest and competent organization. The colonists could communicate their concerns directly to the Kontora in their German dialect. The Kontora provided the Volga Germans with a sympathetic voice in St. Petersburg and they were often responsive to the needs of the colonists. The colony Vorsteher (head of the colony council) consulted with, received direction from, and were held accountable to the Kontora on certain matters. Supporting the Vorsteher were the Beisitzer (councilmen). At the local level, the Vorsteher could promptly execute the decisions made by the Gemeinde (village assembly) generally without interference by the Kontora. The first Vorsteher in Norka after the initial settlement was 32-year-old Konrad Müller from Hessen. The first men to serve as Beisitzer were: Nikolaus Schilling (age 32) from Hessen, Johann Heinrich Lorey (age 31) from Isenburg, Jacob Pluket (age 32) from Isenburg and Johannes Hölzer (age 28) from Hessen. The Volga German colonists held their land in communal ownership within a mir community, which acted as a village government and a cooperative. Arable land was divided in sections based on soil quality and distance from the village. Each household had the right to claim one or more strips from each section depending on the number of adult males in the household. The purpose of this allocation was not so much social (to each according to his needs) as it was practical (that each person pay his taxes). Strips were periodically re-allocated based on the Russian census, to ensure equitable sharing of the land. This was enforced by the Kontora, which had an interest in the ability of households to pay their taxes. 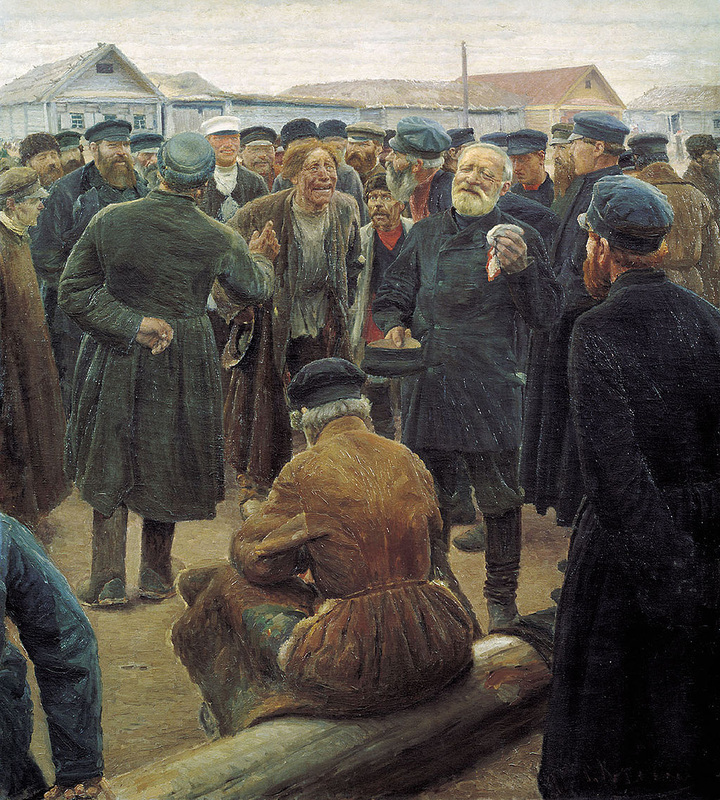 Obshchina (Mir) Gathering by Sergey Korovin. Source: Wikipedia. Under Alexander II's reforms of 1871, many of the special privileges granted to the Volga Germans by Catherine II were abolished and the Kontora was discontinued. From that point forward, the Volga Germans were subject to the same bureaucratic provincial administration imposed on the Russian peasants. The Russian provincial officials were less supportive of the colonists and sometimes exhibited xenophobic hostility towards them. All communications with the government were now required to be in the Russian language, in which few Germans were fluent. The reforms of 1871 required a new type of local government functionary who was bilingual (Russian and the German dialect). At the village level, there was typically a starosta (or Obervorsteher) and the pisar' (or Schreiber) who headed the village government. The disappearance of the Kontora opened the door for corruption of local authorities who were often most concerned with their own financial gain. Norka postal and administrative office in 2009. Courtesy of Vladimir Kakorin. Alexander II also implemented the zemstvo system of local government that was represented at the lowest level by the mir and volosts. By the late 1800's, colonists frequently complained about the paralysis of colony government. Local officials were often unwilling or unable to act without the approval of state-appointed officials. The Bolshevik Revolution swept away the old forms of Russian government and replaced them with the so called Autonomous Volga German Republic. Litzenberger, Olga. Deutsche Evangelische Siedlungen an Der Wolga. Trans. Johannes Herzog and Paul Höringklee. Nürnberg: HFDR, 2013. 441-452. Print. Long, James. From Privileged to Dispossessed. Lincoln, Nebraska: U of Nebraska, 1988. 16-40. Print. "Protestantism in Russia." 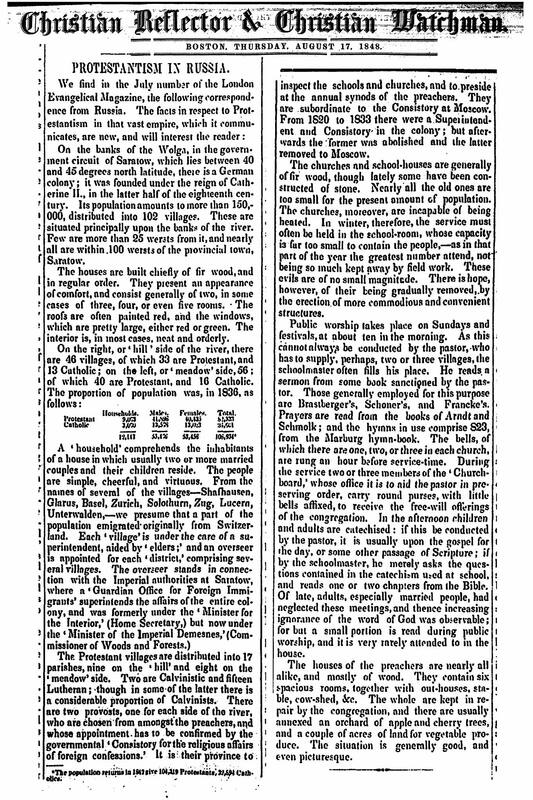 Christian Reflector & Christian Watchman [Boston] 17 Aug. 1848: Print.